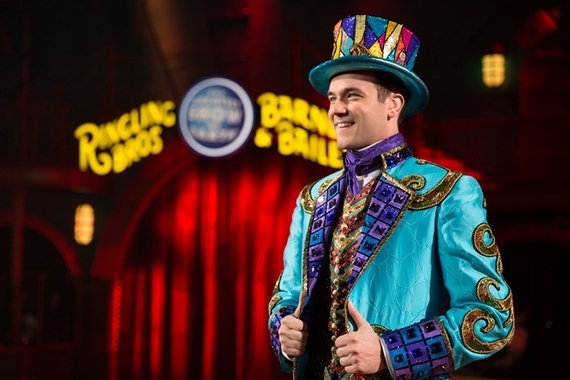 So, You Wanna Be A Ringmaster? For Shipman, his love for traveling and showmanship was fostered early in his childhood. He attended a performing arts elementary school where ballet, piano, and singing lessons were routine. “As soon as I was able to, I was on a stage. I was hooked,” he says. Yet, stardom with The Greatest Show On Earth almost never happened. He missed the audition period by about a week. However, upon realizing this, he still insisted on sending his headshot and resume along. 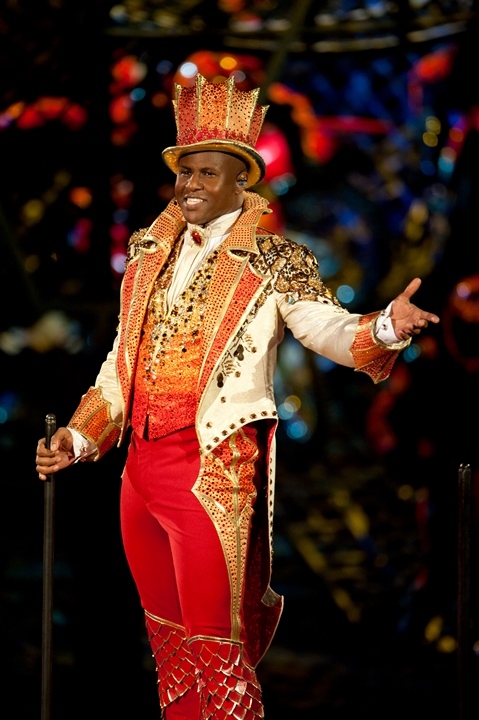 “I thought, ‘The worst they can do is say no.’” Within an hour of sending his materials, he was invited to a private audition for the producers of Ringling Bros. and Barnum & Bailey and the rest is history. For the next three years, the charming Florida native would be entrusted with the imaginations of Children Of All Ages. 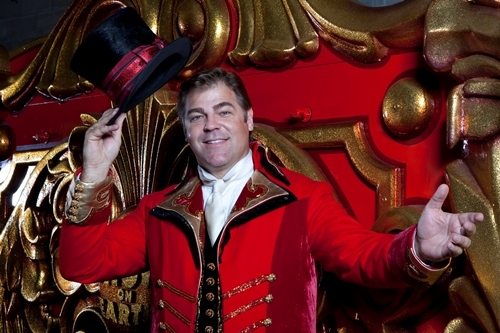 At the end of the 2016 season, David Shipman is set to take his final bow as Ringmaster, vacating one of the most coveted jobs in show business. It is a role I’ve personally reveled in for nearly 18 years. 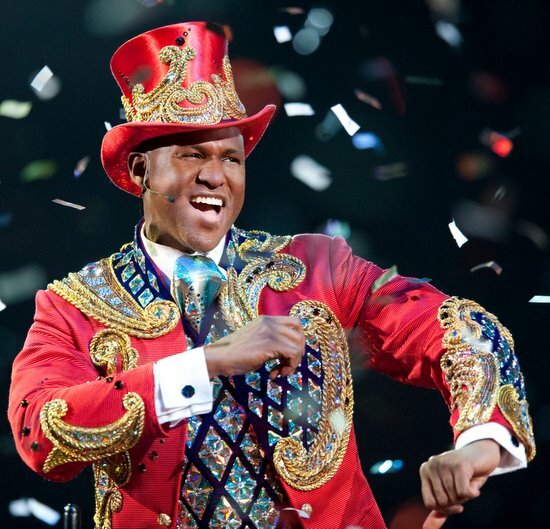 At present I preside overRingling Bros. and Barnum & Bailey Presents Out Of This World – my seventh production in a career in which I’ve been privileged to lend my voice to everything from The Living Carousel to DRAGONS, and now an intergalactic space odyssey. Indeed, it is a huge honor to be the Ringmaster, as it is a remarkable responsibility. Like many, I had no idea what a Ringmaster was. I didn’t know any personally. Even upon being selected as the voice of The Greatest Show On Earth, save for a few anecdotes from late great Ringmasters, Jimmy James Plott and John Fugate, I was on my own. Much of what I came to know about being the Ringmaster came through trial and error. Over the years I’ve had the great fortune of meeting and learning from others who’ve donned the famous top hat and tails, and it has been a pleasure to glean from their experience. The following are just a few of those lessons and anecdotes from our respective experiences as Ringmaster and I am confident they will be of use to those of you who will endeavor to throw your hat in the ring, at one of the auditions being held around the United States and online for the next Ringmaster of The Greatest Show On Earth. There you are bathed in lights, shimmering from head to toe, the penultimate figure of authority in the world of the circus. All at once you are both a participant and a fan. You are the conduit for which the magic and wonder that emanates grandly from a display like no other is perfectly articulated. Yours is no idle stature merely adorned in bedazzled attire, for you are not only the voice for circus – you are its ambassador. Through you, the world at large comes to know and perhaps, appreciate the miracles and miracle makers of the circus. The top hat, tails and riding boots are reminiscent of the Ringmaster’s origins as a horseman. The Ringmaster was originally referred to as an equestrian director.Philip Astley (1742-1814), who is regarded as the father of the modern circus, was himself an equestrian. In fact, the circus rings were designed specifically for horses. However, the position of Ringmaster is not limited to that of a horseman. Some may present animal acts, others might perform magic, or some like me are singers, among other things. Nevertheless, we’re all showmen (or women) who are tasked with the great fortune of presenting the foremost spectacle in all of entertainment. It’s the magic of perception. For the few hours that families will spend with the circus, of the many wonders they might ponder, of this they are sure, the Ringmaster is there to guide them every step of the way. “Many people who come to the circus have never seen anything like the great feats being performed before them. It is [the ringmasters] job to guide the audience through this sensational story,” says Tess Emerson, one of the few women in the circus industry to don the top hat and tails. “Every performance is an opportunity to introduce the world’s greatest talent. You’re the voice for the artists and the brand. 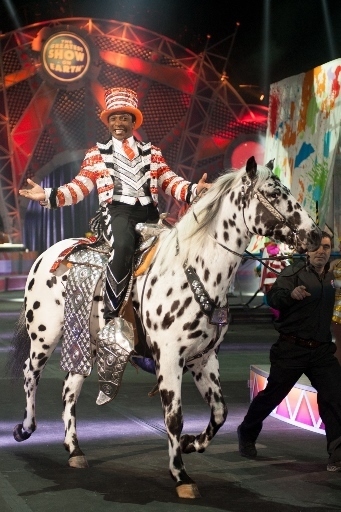 It feels like being the President of the United States and it’s a position that holds great strength and power,” says Andre McClain, who has presided over productions for Ringling Bros. and Barnum & Bailey and UniverSoul Circus. The atmosphere that is the circus is established at the sound of the Ringmaster’s voice. “If I could make the crowd feel as excited about ‘a quadruple somersault to the hands of the catcher’ as Johnny Olsen did about ‘a new car!’ I felt like I was doing my job. I wanted the crowd to feel that I was excited, awed, amused or whatever the moment called for, and that they should feel that way, too,” says the legendary Dinny McGuire. As ringmaster of The Greatest Show On Earth, Dinny’s voice presented us with Arianna The Human Arrow, the Living Unicorn and the first quadruple somersault in the history of the flying trapeze. Acts of other-worldly ability come to life at the ringmaster’s projection, and the artists who perform them can feel the enthusiasm from their guide and the families in the audience. “The Ringmaster is a cheerleader in rhinestones,” says Kevin Venardos. The enthusiasm that he projects with every sonorous announcement is rooted in a deep and abiding respect for the artists, crew, and world they inhabit. “Seeing all those folks from all around the globe getting along and pulling together for a common goal gave me real hope for the planet,” says Dinny McGuire. The Ringmaster has the privilege of witnessing the toil, sweat and genius that goes into creating and maintaining a circus. The driving force in circus is synergy – the responsibility of each individual to the collective. 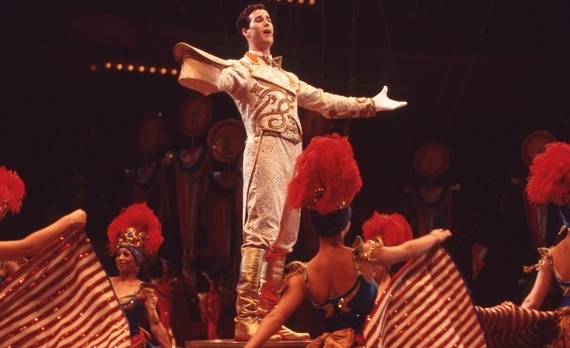 “There is, in my experience, a sense of honor in carrying out your job, shared by most everyone in the circus, and a definite awareness that your job affects the work of others in the show,” says Venardos. All work has dignity in the circus and is to be respected. There are no small parts in the circus, because the stakes are too high for anything insignificant. “Respect and value everyone, and everyone benefits,” says veteran of stage and screen, Chuck Wagner, whose powerful voice also dazzled fans of The Greatest Show On Earth. “Before every single show, I warm up,” says Tess Emerson. “Would a trapeze artist leap off the platform before warming up her shoulders? Of course not! As a professional, she would take the time to make sure her body is ready for the stress it is about to endure. The same goes for your voice,” says Tess Emerson. It all begins with the voice. It is the Ringmaster’s highest priority for obvious reasons. The circus in many ways is the IRONMAN triathlon for vocalists. The schedule is arguably the most grueling in all of show business as you are on the road for over 40 weeks, performing upward of 450 shows annually, in addition to lending your voice to press events, for which there are many. Mother Nature? She doesn’t care how adorable you look in your costume. “It’s always too cold, or too wet, or too dry or too drafty,” says Kevin Venardos. If you’re as unlucky as me, you may have allergies to contend with. Everything from sawdust to animal dander to the pollen counts in various cities. Another fact I learned the hard way I might add, is that you can’t attempt to live like a rock star and be a Ringmaster also. Your body is your instrument and it requires your utmost stewardship. The demands made on the Ringmaster’s throat can never be understated. As Ringmaster, you are called upon to give voice to the circus via a multiplicity of announcements as well as numerous original songs of dynamic range during two-hour performances for two, even three shows a day. Each Ringmaster has discovered their own means of nurturing, protecting and even progressing their respective instrument. “The voice is as unique as the person it belongs to. There’s no one-size-fits-all technique,” says my vocal coach of nearly two decades, Roland Burks. I take at least two voice lessons a month via Skype or even by phone. I make it a habit to work out three to five times a week, be it at a local gym or in a space at the venue. The advantage of working alongside some of the most stellar bodies in the world is that you’ll never be short of good, sound, fitness instruction. I listen to my body and even more so my environment. “I try to drink a lot of water to stay hydrated. Also, as an asthmatic, I have to be especially mindful considering my environment,” says Cristine Herriott. “Your body will let you know when you need to conserve, though it’s easier said than done,” says Chuck Wagner. “Can you do magic?” is by far one of the most frequently asked questions I’ve received as Ringmaster. Audiences, particularly children, see that famous top hat and are utterly convinced at some point a rabbit will emerge. Now, while a literal rabbit is not likely to appear, it doesn’t mean the Ringmaster is without his or her own brand of magic. A Ringmaster is not merely distinguished by their voice or larger than life presence, but their ability to maintain the wonder of the show in the midst of the unexpected. Be it by chance or human error, “the Ringmaster must find a way to keep the show flowing,” says Tess Emerson. Both cast and crew depend on this kind of “magic” from their Ringmaster when matters go awry. That “magic” is meant to preserve the audience. The circus exist to transport the imagination of its audience away from their lives to a place of impossible innocence, and it is the responsibility of the Ringmaster to keep them there undisturbed, as best as he or she can. Being a Ringmaster is not so much a role as it is an extension of who you are. Therefore, the Ringmaster must know him or herself and the responsibility he or she has to the collective that is the circus. “A Ringmaster must be confident, proud and fluid. Stand up straight with your shoulders rolled back. Make sure there is energy in every movement you make. Most importantly, be you. Connect with your audience and let them get to see your personality,” says Tess Emerson. As the public voice of the brand, all eyes are on you, in front of and behind the curtain. You are the catalyst for so much that occurs in your environment. There comes a point in every Ringmaster’s career where they must accept that indeed, he or she is enough. “There are no short cuts. Be patient,” says Dinny McGuire. “Play to your strengths. Find ways to showcase your talent, and do the things you are best at,” says Chuck Wagner. “I may have thought that last show was terrible, but someone out there in the seats thought it was amazing. Even in our worst moment, we still make magic. I learned not to steal from others, the possibility that I was great. If you disagree with their compliment, just smile and say, ‘thank you,’” says Kevin Venardos. “Be self motivated, take the word ‘can’t’ out of your vocabulary, ask a trillion questions and have a great work ethic because you are not just believing in yourself, you are believing in every other artist out there,” says Andre McClain. “To be the best version of yourself for the show, it requires sacrifice, focus, determination, patience and guidance. It’s not without its challenges, but it’s worth it, though, to be able to be a small part of the circus magic,” says David Shipman.